World AIDS Day is being marked by events around the globe taking note of the millions who've died from the disease and highlighting campaigns to control it. As of this 18th World AIDS Day the global epidemic has killed 25 million people. Last year saw 3.1 million AIDS deaths. If they don't get AIDS drugs, 6 million more people will die in the next year or two, notes health information Website WebMD.com. New HIV infections have surged to a record high: an estimated 40,300,000 people. That's 5 million more than last year. 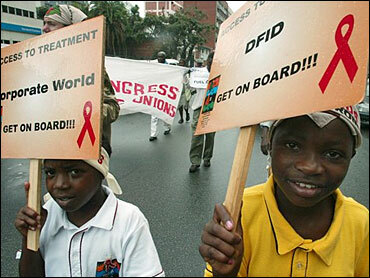 Africa, with only 10 percent of the world's population, suffers over half of its HIV infections. An estimated 2.2 million of those infected are children, according to the United Nations, which is marking World AIDS Day with a new campaign to fight the disease in children. Rich Stearns, president of World Vision, Inc., a Christian relief and development organization dedicated to helping children and their communities worldwide, says unlike a hurricane or tsunami, AIDS is a "constant, insidious disaster" stalking the globe. In Washington, President Bush said World AIDS Day was an occasion to "renew our commitment to turn the tide against this disease. HIV/AIDs is a global health crisis. It is also a daily burden for many of our families and neighbors and friends." Mr. Bush said it's "not acceptable" and "not inevitable" that 40,000 Americans become infected each year. In India, some 70 HIV-infected women stepped out of the shadows during a rally in Golaghat, a town in eastern Assam state, to acknowledge that they are living with the disease and should not be shunned. "I'm happy many women have paid heed to our call and have openly admitted to their HIV-positive status," said Jahnabi Goswami, 28. "Men with the disease need to follow suit." An estimated 5.1 million people are living with HIV in India — the most in any single country except South Africa. Nigeria, Africa's most-populous nation, is third. "Because of this publicity, I really feel I learned something about the harm of AIDS and I will share what I learned with my co-workers, friends and relatives," said Li Hongjian, a young worker with a large red ribbon pinned to his chest. China's government estimates about 840,000 people could be infected with HIV and 80,000 others are likely to be living with full-blown AIDS. However, only about 167,000 are registered as being infected. "We still have a long way to go in AIDS prevention, we cannot slack off in doing this work," said China's Vice Prime Minister Wu Yi at the launch. From the far reaches of the globe, solidarity was shown with the world's AIDS sufferers. Thousands of candles were to illuminate the Swedish winter gloom, with anti-AIDS vigils planned for the capital, Stockholm, and a southern city, Malmo. The British government marked World AIDS Day by contributing $48 million to the global fight against the disease. Estonia's National Institute for Health Development campaigned for increased tolerance and better integration of HIV-infected persons into Estonian society Thursday. With over 5,000 diagnosed cases, Estonia — a tiny nation with 1.4 million inhabitants — has one of the highest numbers of HIV-infections in Europe, spreading in the country mainly through drug use. World religious leaders also added their voices to calls for renewed commitment to fight the disease. Speaking Wednesday during his weekly public audience to several thousand pilgrims and tourists gathered in the rain in St. Peter's Square, Pope Benedict XVI called the figures on AIDS victims "alarming" and reiterated the church's commitment to the care of the sick. In a statement, Archbishop Christodoulos, head of the Orthodox Church of Greece, said AIDS sufferers "should not lose their faith in God but see this major trial as a spiritual opportunity." World Aids Day, meant to boost awareness of the disease, didn't grab everyone's attention. The day's events were canceled by royal decree Thursday in Swaziland, among the most-infected countries and Africa's last absolute monarchy, because they clashed with a traditional ceremony scheduled for the same day. The announcement shocked activists in a country of 1 million where more than 38 percent of adults are infected with HIV — the highest infection rate in the world. Only a few dozen joined a procession in Nigeria's biggest city of Lagos. "Since I believe I don't have it, I don't see why I should march," said Mufu Adebajo, a 22-year-old craftsman watching from his roadside stand. "Otherwise, people will think I have it."